A white bird was perching on the edge of the screamer’s exposed and broken ribcage, hunching while the strong breeze fluttered through its feathers. Its beady eyes were tracking Vimbo, standing before it, standing between the corpse and Mhumhi. Mhumhi was still processing. It was entirely possible, he thought, that Vimbo had only come upon the corpse, that the blood on his mouth was from his own investigation, that the cracked bones were from some other force besides his jaws. Vimbo was looking at him, head high, tail curled over his back. He uttered a soft giggle. Mhumhi looked at the dead screamer. Its head was turned away, so that he could not see its face; the disturbing thought occurred to him that it could have been a dead hulker. Without seeing the eyes, it was impossible to tell. Vimbo caught his eye with his black gaze, then turned. There was a wrenching tearing sound. When he turned back, there was a dark strip of meat dangling from his jaws. Mhumhi took a step back. Vimbo dropped the meat with a grunt. Blood pooled over the garbage covering the ground, dripping over bits of glass and metal and non-biodegradable plastic. The screamers aren’t hulkers. Maybe that’s a good thing. It was as if Vimbo had read his mind, read that same dark thought that had occurred to him the day before: that the screamers were a voiceless, mindless, overpopulated source of meat. Mhumhi picked up the meat that Vimbo had dropped in his jaws, gulped it down. It was no longer very warm, but it was still good, still right, compared to the trash he’d been eating the last few days. Vimbo stepped aside with another little giggle, allowing him access to the corpse; Mhumhi found he didn’t need his permission. He went and ate. The birds were calling, swirling above them; the one perched on the ribcage lit in a flurry of scolding. Vimbo joined Mhumhi, heavy and warm on his left side, and tore through the screamer’s thigh. Mhumhi heard the sharp snap of a bone cracking. They ate together, in a strange kind of companionable silence, for some time. 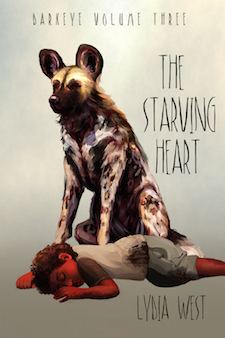 Mhumhi’s belly filled, and he pulled a bone to one side to gnaw at it in a kind of numb satisfaction. Vimbo circled the corpse, grunting at the birds when they tried to land. The bone felt good between Mhumhi’s teeth, a satisfying, scraping pleasure. It still bore the flavor of the meat it had once carried. He had a kind of drowsy visualization of a future where such pleasures were not denied him; all he would have to do was stay here, and kill screamers as often as he liked. He took his mouth away from the bone, keeping it clamped in his forepaws. Would the rest of his family be in such a future? He felt suddenly ashamed. He had come here looking for fresh water, and had instead gorged himself on this meat. It wasn’t as if giving it to them now would do any good. He got to his feet, leaving the bone where it was. Vimbo stopped in his tracks where he had been pacing and looked at him. The hyena merely stared at him, eyes round. “Never mind,” said Mhumhi. He gave the corpse one last sniff. Perhaps he could trail the screamer’s scent to somewhere it had once drunk water… but he was fooling himself; he was no tracker. And the scent would probably lead him straight back to the filthy pool. Vimbo grunted, pushing against him, making him jump. Vimbo grunted again and stepped over the corpse, looking back at him. Mhumhi felt his heart quicken- it looked as though Vimbo wanted him to follow him. Had he somehow understood…? He was fooling himself, that was for certain, but he stepped after the hyena. Vimbo made a soft sound and loped forward, across the garbage, scattering white birds. Mhumhi had to trot to keep up. Vimbo was looking back at him over his shoulder again, grunting. Mhumhi started to walk after him again before stopping short. They were headed in the opposite direction that Kutta and the rest were in, getting farther and farther away. Vimbo kept moving onwards, moving swiftly along the water’s edge. Mhumhi hesitated for another moment before trotting quickly to catch up with him. They moved side by side over the damp ground. Mhumhi became conscious that there was less garbage here than before- damp sand was pressing between his toes. They rounded a pile of trash and suddenly came upon a row of hovels, barely more than cloth-covered lean-tos. Some had fallen down, and on others, the fabric had rotted through. Mhumhi’s pace slowed. Vimbo grunted, moving down between the hovels and the surf, leaving vast pawprints behind in the sand. Mhumhi ducked his head and inhaled nervously. He was half-afraid that the hovels would be occupied, perhaps by things with more sentience than screamers, but they seemed truly deserted, sad scraps of fabric fluttering in the wind. Near the end of the miserable row there was something large perched on top of a pile of trash that Mhumhi could not make sense of. It was menacing, and rather yellow, with a cab like a car and a scooplike metal apparatus attached at the front. The position it was in seemed precarious, as though it might teeter off the edge of the pile at any moment, but Mhumhi thought that that was probably an illusion. The huge rubber tires were half-buried; the whole thing was quite immobile. On the ground below the yellow metal contraption was a low-slung building, a flat concrete square of a construction with no door- just an empty hole. It was this that Vimbo seemed to be ultimately leading him to, for he kept glancing back over his shoulder more and more frequently, favoring Mhumhi with an open-mouthed grin. Mhumhi felt like whimpering. The last room was a tiny bathroom, with a toilet and a little metal sink. He jumped on top of the toilet right away, slipping on his rear legs, and pawed at the double-cross handles. The tarnished metal creaked and reluctantly started to turn, and with a hissing and sputtering, there came the water. Mhumhi lapped it up, and it tasted clean, and cool, and faintly chemical; it was city water. He thrust his snout under the stream and shook his head, spraying the filmy mirror with droplets. He turned off the sink and got back down. He was so relieved his stomach hurt. Clean water. He trotted back into the other room and found that Vimbo had spread himself out onto the low table, the vast bulk of him covering so that his head and paws dangled off the edge. He turned his ears in Mhumhi’s direction. Vimbo merely stared at him. Mhumhi licked his lips. Vimbo raised his head and tilted it slightly to the side. Mhumhi felt disheartened. Either Vimbo only understood certain words, or he had actually led him here by coincidence. This dampening of his mood led him to another sorry realization. Despite the fact that he had found a source of clean water for Kutta and Tareq, there was the problem of getting it to them. He felt sure that he would make little progress carrying it to them over such a long distance, with the small amounts that were all he could manage at once, and having them travel here… In their current state, that seemed impossible. There was no point in deliberating over it any longer. He had to start bringing the clean water back to them, best he could. He had likely already left them alone for too long. Mhumhi swallowed. If only they had the cart again, or something like that- something that they could use to carry things. But that line of thinking was pointless as well, because they would need hulker hands to strap them in. Mhumhi looked back over at Vimbo, who had rolled over on his side and was stretching his legs, yawning. Vimbo blinked at him, his round clown’s face betraying nothing. Mhumhi gave a short sigh through his nose. There was nothing else left that he could do. He stepped back outside the building, blinking in the bright sunlight. A single white bird was drifting overhead, clearly visible against the brilliant blue sky. The trash shimmered and stank in the heat. Mhumhi began rooting around, looking for a container like the plastic milk jug he had found before. Something with a handle- something he could easily grip in his teeth. Plastic bottles he could only carry sideways or drag by the neck, and that was too inefficient. A creaking sound made him look up. He had been nosing around at the base of the pile of trash that the giant yellow machine was sitting on. It was hard to see from the angle he was at, but there might have been a flicker of movement in the window of the cab. Mhumhi stepped back, craning his neck upwards. The yellow door swung open, hanging downwards from the way the machine was tilted. There were more creaking noises. Mhumhi’s heart was beating rapidly. Something was coming out of it. He saw first the long, skinny legs, then the rest of a screamer half-crawled, half-slid out of the cab, yawning and drifting lazily along on the slippery trash. Its naked dark skin was filthy and covered in powdery dust. Mhumhi let out a slow breath. Only a screamer. He was not sure what else he had been expecting. The screamer was stretching, eyes half-lidded, stumbling the rest of the way down the pile. Mhumhi put his head down and started up his search again, turning over the remains of an old beach chair with his nose. There was a loud crinkling sound. Mhumhi glanced back over to the screamer. It had stopped short in a nest of wrapping paper, and was staring at him, dark eyes wide. This seemed to startle the screamer so much that it fell backwards onto its rear with a little shout. His stomach twinged, and he flinched, and then stepped closer to the screamer, which was staring at him, slack-jawed. “Come here,” he said, licking his lips. He held stock-still, his heart hammering. It- it talked. And it knew? But how? The screamer froze. Mhumhi stepped closer, staring at its face- it cringed away, squeezing its eyes shut. “Look at me!” Mhumhi commanded. It was more like what a dog’s eye looked like, or… or like a hyena’s eye. “Are you a bouda?” Mhumhi stammered. The not-screamer’s throat convulsed as he swallowed. Mhumhi caught a faint scent from him, a familiar musk mixed with the watery scent of hulker. A loud splintering noise made both of them look towards the concrete building. Vimbo was standing in the doorway, stretching, one half of a chair in his jaws. “See,” Mhumhi began saying, turning back to the bouda, but it was already halfway back up the pile of trash, scrambling. Vimbo dropped the chair and whooped, his tail erect. Mhumhi ran up the pile and around in front of the bouda, stopping him. The bouda stumbled, the whites of his eyes showing. Vimbo whooped again, moving closer on the other side. The bouda was shaking, looking back and forth between them. Mhumhi tried to keep wagging. Vimbo had killed a screamer, but… he would not kill something he knew was intelligent, would he? Vimbo was moving closer, a giggle escaping him. It occurred to Mhumhi that he might be making the same initial mistake. He had to hope Vimbo would recognize the word, and indeed, the hyena seemed to, swinging his head around to stare at him for a moment. His round eyes looked just like the bouda’s. Vimbo gave a sudden squeal and pounded up the pile towards the bouda, teeth flashing. The bouda screamed. Without thinking Mhumhi flung himself between the two of them. “Vimbo!” he cried, the fur on his back rising as the hyena stopped short. “Please, god,” sobbed the bouda, on the ground behind them. Vimbo gave a loud squeal, pacing back and forth in front of Mhumhi, craning his neck to look at the bouda behind him. Mhumhi held himself there, tail raised, panting. Vimbo looked at him a moment, then lunged forward. Mhumhi met his advance with an angry twitter, and again the hyena arrested himself. The hyena squealed, wheeled around, and loped away, around the side of the pile and out of sight. Mhumhi took a moment to pant, drool dripping from the tip of his tongue. “You scared him off,” breathed the bouda, rustling in the trash above him. “With what?” said the bouda, drawing his arms around his knees. The bouda swallowed again, his eyes flickering. It was clear he thought he’d be eaten if he refused. Mhumhi felt mildly uncomfortable with the assumption, but he let it lie. This got him a blank stare. The bouda put a hand up to his tangled hair. He turned and began walking slowly away. After a moment there was a loud rustling of trash, and Sekayi stumbled after him. Mhumhi paused, looked back at him, and Sekayi squirmed, pressing his hands together. He picked up the pace, and Sekayi scrambled after him. The term surprised Mhumhi so much he stopped short. He swayed, suddenly dizzy. There was a stabbing pain in his stomach. “I’m fine,” said Mhumhi, and forced himself to take a step forward. The smell of trash seemed even stronger, nauseating him. His belly hurt like it had been ripped open. “We have to hurry up,” he said, and then vomited. “Hey!” called Sekayi, jumping back, as Mhumhi kept heaving, throwing up everything he had eaten before, all that dark meat. His flanks shuddered; the horrible pain in his stomach did not decrease. He fell over onto his side. “You sick?” Sekayi seemed to be saying. Mhumhi saw his hazy form peering at him from a distance. He tried to get up, but all the strength had gone out of his legs, and they merely cycled weakly. His stomach heaved again, and he lifted his head to spit bile. Sekayi stared at him a moment, chewing his thumbnail, then he stepped back. “My family,” said Mhumhi, his voice hoarse, trying to push himself up. His forelegs shook. Sekayi took another step back, his dark eyes growing sharp. Mhumhi said nothing, quivering and looking up at him. Sekayi gave him a little half-smile, and then turned and ran.